When Nvidia launched the GeForce GTX 900 series of graphics cards last year, the company decided not to bundle a free game with each purchase of a flagship GPU. But with the impending launch of a GameWorks-enhanced, resource-intensive title, Nvidia have decided to bring back bundled games to add a bit of extra value to each GPU purchase. The game in question is The Witcher 3: Wild Hunt, an open-world RPG that's set to launch on May 19th. Previews of the game have already revealed stunning visuals thanks to developer CD Projekt RED's REDengine 3, which judging by past releases will take quite a lot of graphics horsepower to run. And as with most Nvidia-bundled games, The Witcher 3 is a GameWorks title featuring HBAO+, HairWorks and PhysX. 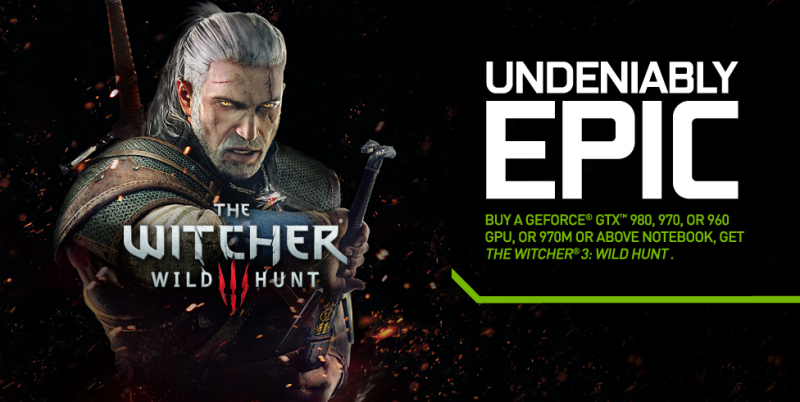 Starting today, anyone who purchases a GeForce GTX 980, 970 or 960 graphics card, or a notebook powered by a GTX 980M or 970M, from a participating retailer will receive a voucher to download The Witcher 3. As you'll notice, this bundle is strictly reserved for high-end GPU purchases: mid-range cards like the GTX 965M and GTX 700 series are ineligible. The "Undeniably Epic" game bundle from Nvidia is available in all regions except China, and will run from today through to May 31st. If your purchase does include a free copy of The Witcher 3 (and we advise you check beforehand, as not all retailers participate), the download will be provided DRM-free through GOG.